It's amazing how a story with so few words can convey such an important message. Little Boat shows us that being small doesn’t need to hold you back. Not at all. We are introduced to Little Boat in a vast ocean, but the brave boat is not bothered. He takes control of all situations: he charts his own course and deals with dangers such as sea monsters, terrible storms and treacherous rocks. The illustrations in this book are very special. When the boat is reflecting that he is small, the illustrations are framed circles, which might make you think of the view through portholes on a boundless sea. When the boat feels big, the illustrations spill out of their porthole frames to fill the whole page with energy. After conquering all the dangers, we discover the little boat has been on a mission to see his friends. No wonder he didn’t let the size of the ocean hold him back. 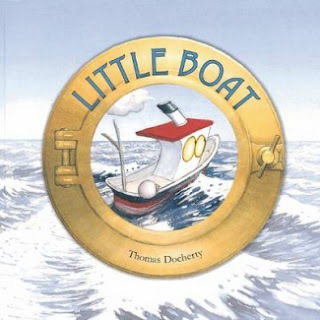 With his energy renewed from playtime, the little boat continues, ‘Full steam ahead to the edge of the world.’ The story comes full circle and we are reminded that no ocean is too big for a Little Boat. If your child likes sea creatures, this books will be a perfect read for them. The friends include an enormous whale who can lift dolphins, boats and octopuses. Spectacular.